Eczema is a chronic inflammatory condition characterized by dryness and scaly patches of skin. It occurs most frequently in infants, although many people tend to “grow out of it” by their early twenties. Eczema also runs in families, indicating that genetics may play a role. Since this disorder involves an overactive immune system, people who have it often suffer from asthma or seasonal allergies as well. Avoiding irritants and applying topical treatments to moisturize the skin may help to ease symptoms. In addition, supplementing with flaxseed oil, an abundant source of the essential fatty acid alpha-linolenic acid, may help to decrease inflammation. Flaxseed oil comes from the flax plant, also known as linseed. Flax has been cultivated for centuries for its fiber and seed to produce textiles, dye, soap, paper and medicinal preparations. Today, the plant is commonly found in cattle fodder and the oil is used as a finish for painted and varnished surfaces. Flaxseed oil is also sold as a vegetable oil for cooking and in encapsulated form as a dietary supplement. 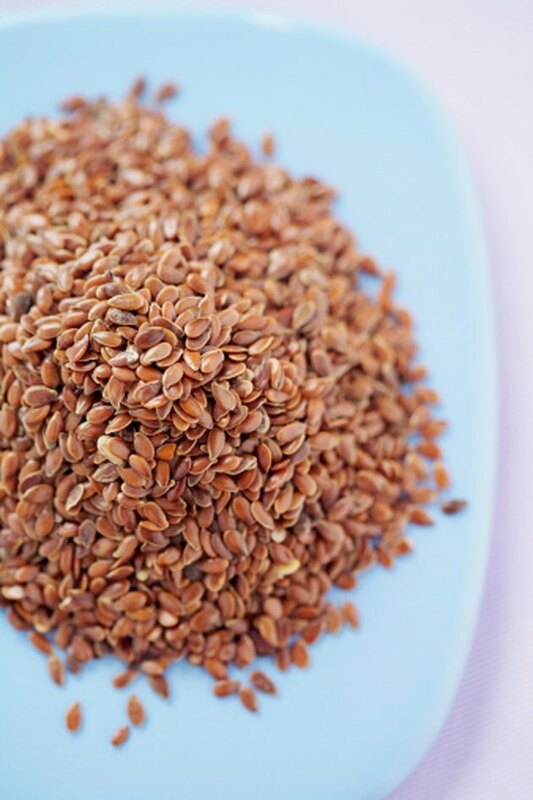 According to the “Physicians’ Desk Reference for Herbal Medicines,” flaxseed, which contains up to 70 percent linolenic acid and up to 30 percent olenic acid, is the richest known source of omega-3 fatty acids and lignans, a class of chemicals with estrogenic properties. However, MayoClinic.com states that flaxseed oil contains only the alpha-linolenic acid portion of the seed compounds and is void of fiber and lignans. Alpha-linolenic acid and lineolic acid act as substrates, or building blocks, for a variety of lipids that regulate inflammation collectively called eicosanoids. Specifically, this group consists of thromboxane A2 and thromboxane B2, prostaglandins and leukotrienes. Increasing dietary alpha-linolenic acid intake results in increasing available levels of eicosapentaenoic acid and docosahexaenoic acid, the same omega-3 fatty acids found in cold-water fish. The University of Maryland Medical Center says that fatty acids from fish oil have been shown to reduce inflammation, although the body’s ability to convert alpha-linolenic acid into eicosapentaenoic and docosahexaenoic acid is questionable. However, flaxseed compounds offer the additional benefit of blocking the activity of other agents in the body that produce inflammation, including TNF-alpha and interleukin-1 beta. People with schizophrenia or diabetes may not be able to synthesize eicosapentaenoic and docosahexaenoic acid from alpha-linolenic acid. If this applies to you, take fish oil instead of flaxseed oil. Do not consume flaxseed oil if you have a known allergy to plants in the Linaceae family. Talk to your doctor before supplementing with flaxseed oil if you take any medications, such as blood-thinning drugs.